Maister, Green, and Galford, in their Consulting to Management journal article called, “What is a trusted advisor?” remind us that we do not start out as trusted experts in our field, but many times, that is our goal in life (their related book is shown toward the end of this article). I have seen this in myself, as well as my peers, and those who have succeeded in reaching that goal. Being authentic means discarding all of the techniques on how to “win someone over” or “impress them.” In my marketing field, that would be tossing out the very hype that we are often taught to use. I have met some wonderful people who have combined degree paths of marketing and psychology. Those that apply it well, realize the value of the human. Those who do not, seem to think that the study of psychology is the ticket into understanding what makes people tick and manipulating them into a sale. Even Mr. Block pointed out that people can see through that. They know when a consultant is being fake. Therefore it is essential, in building trust, to be authentic. One of the sections in Flawless Consulting included a discussion on “Completing the Requirements of Each Phase.” Skipping steps can cause the client or line manager to become edgy. It also does not enforce the foundational steps needed in building trust. Just like a house requires the foundation before framing and before the sheetrock, so consulting needs to be thorough and built in the right order. Being fair is a good ideal for life, but it also applies to consulting. Building trust does not mean becoming a doormat as a consultant, but finding balance and approaching it in a healthy manner, especially in the area of communication. This, too, will help the client or line manager to have a balanced view of the contract and working relationship and build further trust. In one of my positions as Director of IT, I was often put in a position of serving other capacities. In that capacity, I became a consultant of sorts, offering answers to our wealthy clients’ questions and offering suggestions on how they could use their technology to help them reach their goals. After I had helped one particular client, he requested that his financial advisor put me on the access list for his bank account. That is trust. And, that is an example of building trust. After graciously declining, with the explanation that I could still assist him in the same capacity without that access and that I appreciated the trust, I pondered the situation, wondering what it was that built trust in that situation. I realized that that respect of the person and understanding the client’s emotional needs, was really what built up that trust. It is nice to have an explanation of what it is that happened. To me, it was about treating the client with respect and kindness because he was a human being and not because he had a lot of money. Somehow, that respect must have been what he needed, emotionally, being accustomed to good treatment based on his status, and it caused more trust than I was expecting. Being able to learn new skills and re-frame past experience in light of this newfound knowledge helps us to see the success, but also to see it in practice. Are you ready to strive to be a respecter of people and not just implementing ways to manipulate people into thinking they are satisfied with the consulting? That method of really caring about people, in the process of consulting, seems to be a foundational cornerstone in building that trust. And, trust, well, it just seems to pay off in the long run. Very important. That’s why I have one. Starting a consulting business or any kind of solo-entrepreneur practice where you play a consulting role. It can really be liberating. Setting your own hours, deciding who you do and don’t work with, and not having to commute every day are well worth the risk inherent in handing in that two weeks’ notice. Thanks, Mercy, for your comment. And, would you say that “Trust” is a key element in that liberating endeavor? I totally agree on those three principles; Authenticity, thorough and Fairness- it never fails to help one earn a client trust once they detect these qualities ,they’ll keep coming back for more of your services. 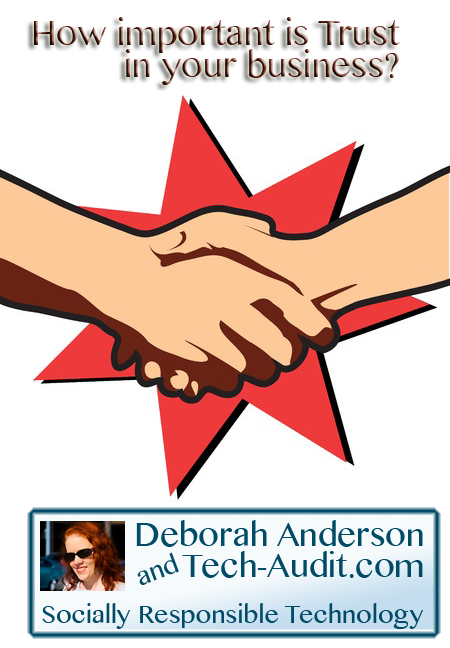 Thanks Deb for the reminder that true integrity still pays. Wonderful website you have here but I was wanting to know if you knew of any user discussion forums that cover the same topics talked about in this article? Previous post: Need A Scientific and Technological Way to Get a Boost of Energy? Start Your New Year With AeroLife!